BJP has won many state elections in India by propagating the successful Gujarat model to people. Therefore, if it fails in Gujarat then it's Gujarat Success Model will also fail, and it will not have any other thing to boast in the 2019 Loksabha election. Gujarat is under the BJP rule from last 22 years, therefore, BJP will never like to lose it. So far, there is no immediate worry for BJP because most of the opinion polls have predicted that BJP will again make next government in the state, however, there is worrying sign that BJP vote share may decrease or Congress vote share may increase significantly. Moreover, BJP needs to fight the 22 years of incumbency in state and 3 years of incumbency at the center. To make things more difficult for BJP, many new and young leaders have emerged in Gujarat like Hardik Patel representing Patidars, Aplesh Thakor representing OBCs and Jignesh Mevani representing Dalits. These three young leaders are main pain creators for BJP and they have the power to derail BJP's ambitious train towards victory. On the other hand, Congress sees an opportunity in all this because, after so many years, it has got some hope in the state. Though, things are not so easy for Congress because, in last 22 years, it has lost most of its base in Gujarat and it will affect Congress prospects in the state. Congress's main star campaigner Rahul Gandhi is aggressively visiting Gujarat to revive Congress in the state and he is missing no opportunity to fire at the central and state BJP governments. 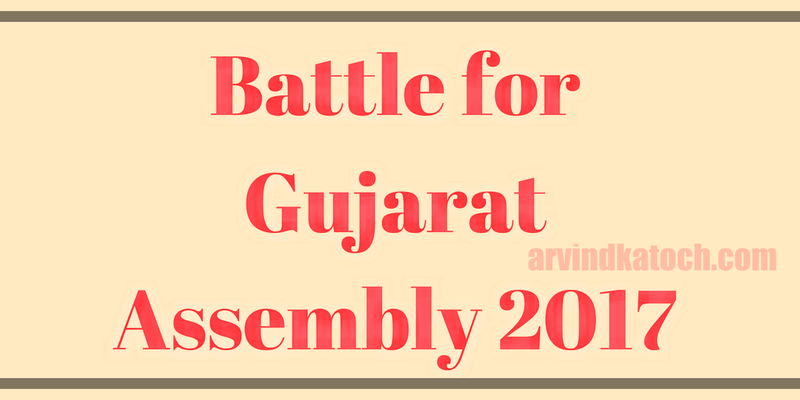 Overall, 2017 Gujarat Assembly elections will see an interesting battle, because BJP will face some challenge in this election after a long time.